KWBY Woodburn OR 940, heard last Saturday. Both were heard on an RF Space SDR-IQ. I heard the 0500 UTC announcement and morse code at 0515. Not much else. Further south in Norway they had much better signals. Heard with an RF Space SDR-IQ and a 350-metre beverage antenna. Conditions in general were poor despite good K-indices, not even CKMX was at readable levels and I heard a weak XEEP. My guess is that WBIX got out extremely well though. Early on October 15, conditions towards the northern part of Japan were excellent, giving AFN Misawa 1575 with a good signal, and also low-powered HBC Sapporo relays on 1494 and 1557. Here is another low-powered relay, that of NHK-1 station JOPG in Kushiro, Hokkaido. The main station is on 585; the Nemuro relay is on 1584. You wouldn't expect 100 watts to sound this good. There is another NHK-1 station which a friend of mine in Japan is trying to ID for me. Cool catch! Some might want to rename this blog to arcticdx.bragspot.com... Heard with an RF Space SDR-IQ; the audio file is recorded in 64 kbps quality with Total Recorder. Internet Explorer users may not find this as easy to access as Firefox users. I don't know why. All except KQIK (IC-746Pro) were heard with the SDR-IQ. Ibiquity (ibiquity.com) has a list of 1618 stations currently carrying FM and AM HD, of which 259 are AM as per today (I don't know how old the list is and how often it is updated). I took the liberty of copying the AM list, shuffle the columns a bit to better suit a DX-er, and pasted it into the Google spreadsheet you can access here. I don't know if I have violated copyrights or not; if so the list might need to go away. All of the stations listed are not necessarily running IBOC, and several are probably running IBOC daytime only. I believe the list is of stations that are authorized by Ibiquity to run IBOC. Unfortunately (for the DX-er, and for the low power station owner nearby), many of the 50 kW stations run IBOC. KSL below is a classic example. Others: WXYT-1270, WTAM-1100, WBZ-1030. 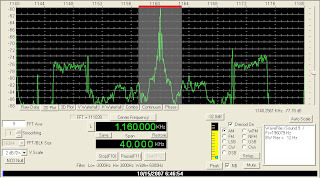 The good thing (for the DX-er, not for the low power station owner nearby), is that it seems like a certain signal level is necessary for the digital hash to occupy the neighbouring frequencies. Unlike DRM, which requires very little signal indeed before the frequency is left useless. So a relatively weak KSL will not pollute 1150 and 1170. At least that is my experience. IBOC Rules The Waves - Or Waives The Rules? "Impressive" bandwidth KSL has here. 30 kHz just to make so-called High Definition AM? Did FCC approve this? One can become a DRM-fan for less. Wait! No. One can't. Ever. I think I heard WLQV (was it WDEE in those days?) back in 1975. It is the by far most dominant station on 1500, only occasionally losing ground to KSTP. This evening I finally got a reply from them after a number of tries. Thanks OJS for contact info. Much wanted. Finally heard this one, which is very common further south, in Kongsfjord. And with a signal strength that impressed the station's President! Still, it was up only a few minutes around a full hour on October 9, 2007 before it faded into nothingness. New state. Thanks Arild Skalmeraas for contact info. Receiver: SDR-IQ. Finally got an ID! I've been hunting CKRW all autumn, and sometimes heard it with good signals, but never during an ID. CKYL never allowed it enough space. On January 12 though, I had set my new Perseus SDR to record via remote control, and finally on the full hour I got a partial ID. I didn't hear the call, but did hear "...and 98.7 in communities" which is part of their ID and which can be heard on their web stream as well. A long and detailed response came tonight by email. Thanks Arnstein Bue for contact info. Conditions that morning favoured the Washington state to Alaska region with CBC Whitehorse 570 the strongest I've ever heard them, and Alberta stations surprisingly weak for a change. September 26, 2007 was a good day for Minnesota stations in Kongsfjord. KVBR surfaced on top of the hour with a rather weak, but clear identification. I received an email verie this evening. Heard on an SDR-IQ. My 25th Minnesota verie.